A listing of all known facts about the Baldur's Gate 2 expansion released in June 2001. It describes new features, new areas, new spells, items and much more. Here you'll find a detailed and complete walkthrough of all the areas in Shadows of Amn and Throne of Bhaal, including Watcher's Keep. Maps, items, NPCs, shops list with inventory, various tips & tricks, character creation - you'll find it all and more covered by this extensive guide. Here you can find a detailed solution for BG II. Also check out Sylvus' amazing introduction to the regions of Amn, information about its capitol city of Athkatla, a list of NPCs that are able to join you in the game, spells list, monster beating strategies and much more. Sword Coast Stratagems is a collection of interconnected mini-mods for Baldur's Gate (on the BGT/BGTUTU/BGEE versions) and Baldur's Gate II. SCS is primarily a tactical mod - the idea is to make combat more interesting and tactically challenging, rather than just making it harder by brute-force methods like tripling all the damage rolls. SCS also includes a few ease-of-use features and tweaks. This guide explains in considerable detail the kind of analysis, preparation, and decision making that can produce a successful campaign, all supported with numerous videos showing you how the author has played the game. A complete walkthrough for Baldur's Gate 2, including the Throne of Bhaal expansion. There may be truth to the assertion that everyone has their own approaches, and that there is no such thing as the 'perfect party' or the 'perfect strategy'. Nonetheless, the author has deeply entrenched viewpoints on the best of way of doing things. The walkthrough is written on the basis of those viewpoints. It takes the reader through the game as he has played it. The author has also added notes on the Solaufein and Ascension mods. Another exclusive guide from Sorcerer's Place. This one will give you all the info you need about the classes & kits that are available in Baldur's Gate II. The list also details the Barbarian, Monk & Sorcerer optional classes. There is also an older version of this guide I made long before BG2 has been released and most of the information about the kits in that one was taken from AD&D manuals. Check out both and see how different Bioware's implementation of a kit is from the official version. A list of all NPCs you can find in the game and its expansion, complete with their detailed stats, portraits and locations. Don't miss the spotlight on Keldorn, Aerie and Jan here! Their portraits in the article are still concept drawings, but I left them there intentionally so that you can compare them to the final ones in the guide above. A pretty good walkthrough covering the three new chapters the expansion adds to the game, but not the optional Watcher's Keep. It also lists the new weapons Cespenar can make for you (and the components you need), reveals what the Wish spell can do and describes the new NPC, Sarevok. A downloadable version is also available. Probably the most detailed and biggest fan-made FAQ/Walkthrough for Baldur's Gate II & Throne of Bhaal in existence. Simply put, this solution has it all. A short walkthrough for The Black Rose: Part I mod. A detailed walkthrough for the Planar Sphere mod. A full walkthrough of the Throne of Bhaal Watcher's Keep. It comes in Word document format, accompanied by screenshots. Not a walkthrough, but a simple list of the quests and any interesting diversions in Baldurs' Gate 2: Shadows of Amn. Included are the different options for quests and minor things that happen as well or could be taken note of. An exhaustive guide to Throne of Bhaal covering such topics as item locations, encounter strategies, weapons, spells, enemies etc. It also includes a walkthrough. A downloadable version is available as well. A basic online guide containing character creation advice, some tips, a walkthrough and quick look at the NPCs, quests and features. A complete basic online walkthrough of the Baldur's Gate 2 expansion. As usual, SJC delivers another nice walkthrough. This one is concerned solely with the quests and characters contained within TeamBG's Shadows over Soubar mod, although where there is cross-over to the main game the author will make mention of this, if it is considered necessary. A detailed walkthrough dealing with all the new stuff TeamBG's unofficial mod introduces - NPCs, quests, new areas and so on. This walkthrough assumes you have played BG2 and are familiar with many of the conventions from that game. 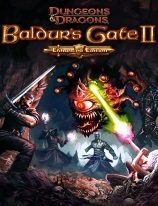 It is concerned solely with the quests and characters contained within Epic Endeavours, as there is no cross-over from Baldur's Gate 2.